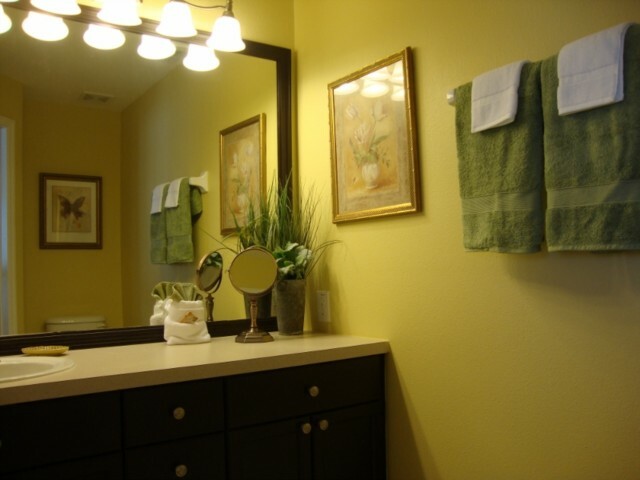 3 bedroom, 3 bathroom villa in the Windsor Palms Resort community. Owned by Sharon Mader and Tanya Mader-Frans. Ref: 3520. We know that for many families a trip to the Disney area is a once in a lifetime experience. Picking the right accommodations can make or break it. We are sure you will be pleased with all we have to offer. For privacy reasons, the marker on the map shows the Windsor Palms Resort community location and not actual villa location. We know that picking the perfect rental home for your famiy vacation is a very important decision.. We also know that you may have lots of questions; please contact us via the request forum at the bottom of this page and we will do our best to answer them. 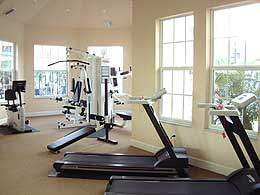 Come find out why we have had many happy guests and why many of these guests choose to return to our end unit townhome. Dont worry about arriving late as we have a coded door lock at the home so you dont have to travel to the management company to pick up your key. Exact home address , directions and door code will be given once the final payment is made. Our local management company is available during normal office hours and 24/7 for any emergency that may arise. 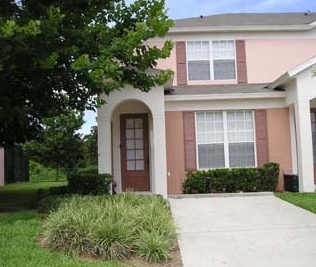 Windsor Palms is ideally located just 3 miles to Disneyworld. (We know a shortcut that we will tell you about) Windsor Palms Resort is a 24 hour manned gated resort with many resort facilities. These include Tiki Bar...Olympic size pool... whirlpool and spa, ...lighted tennis and basketball courts...beach volleyball court...children's splash pad...children's play area...clubhouse with ping-pong table and pool table...picnic and bbq area...sundry shop...55 seat cinema (choose your favorite movie at the sundry shop FREE and pick your time)...video arcade (small charge)...A shuttle to local area attractions is available at the clubhouse (charge payable and reservation required). Bikes are also available for hire. Windsor Palms is close to shopping, golf and restaurants but when you pass by the palm trees as you enter the gates of Windsor Palms you will be in your own quiet oasis away from the crowds. 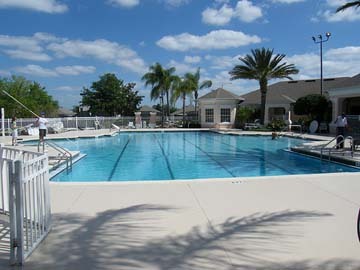 Our townhome is a very easy stroll to the clubhouse and main pool. (Approximately 300 yards.) It takes us less than 5 minutes walking with little children. The sundry shop at Windsor Palms has everyday items such as cereal, bread, juice, eggs, butter, newspapers, magazines, sun tan lotion, toilet tissue etc. You can also pick up a freshly made cup of Starbucks coffee. and away you go. 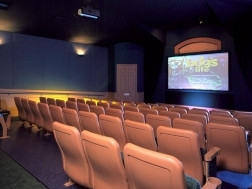 You can even purchase freshly made popcorn at the sundry shop to munch on while you are enjoying the show. YumYum. Our home is self-catering and we supply a starter supply of toilet tissue, paper towels, garbage bags, dish detergent, washing powder, hand soap and bath soap. 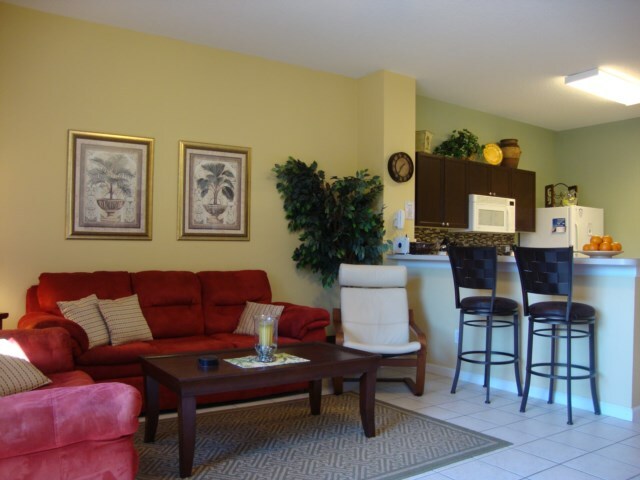 Welcome to our bright, spacious townhome located in beautiful Windsor Palms. 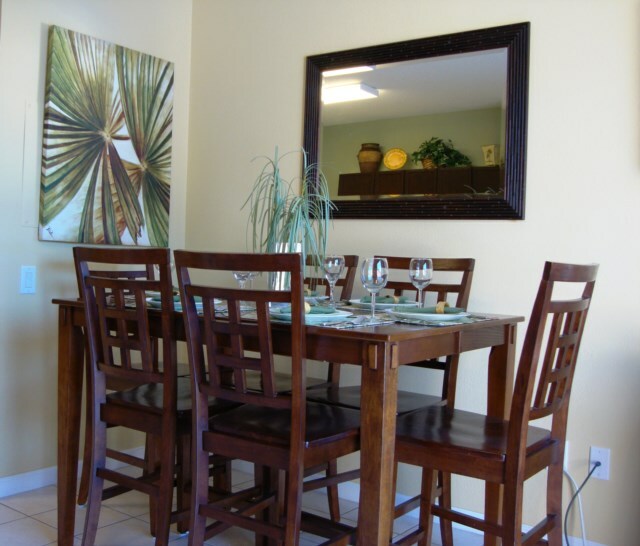 We spent a lot of time looking for the perfect home for a vacation and we found it at Windsor Palms Resort. 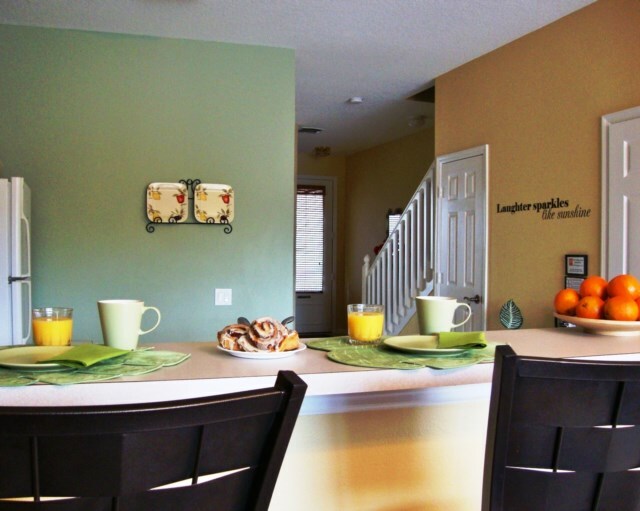 We are continually upgrading our home so it will be just right for your precious family vacation. The kitchen is fully equipped with all the esentials you will need. Refrigerator (with ice maker) stove, dishwasher, microwave, toaster, keurig coffeemaker, blender, tea kettle. We have supplied lots of pots and pans, baking utensils, tea pot, dishes and cutlery for the whole family. Yes, we even have egg cups. We have provided unbreakable dishes and wine glasses for use in the pool area. There is plenty of comfy seating in this bright, sunny room. This room is equipped with a 42 inch flat screen tv, DVD and VCR player. The dining area has a dining table that seats six but can be extended to sit eight. 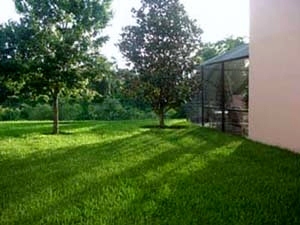 Directly off this living room are large patio doors leading to your own private splash pool and lanai area. This end unit lanai overlooks the quiet conservation area and the doors open to the Resorts nature trail for that morning walk. 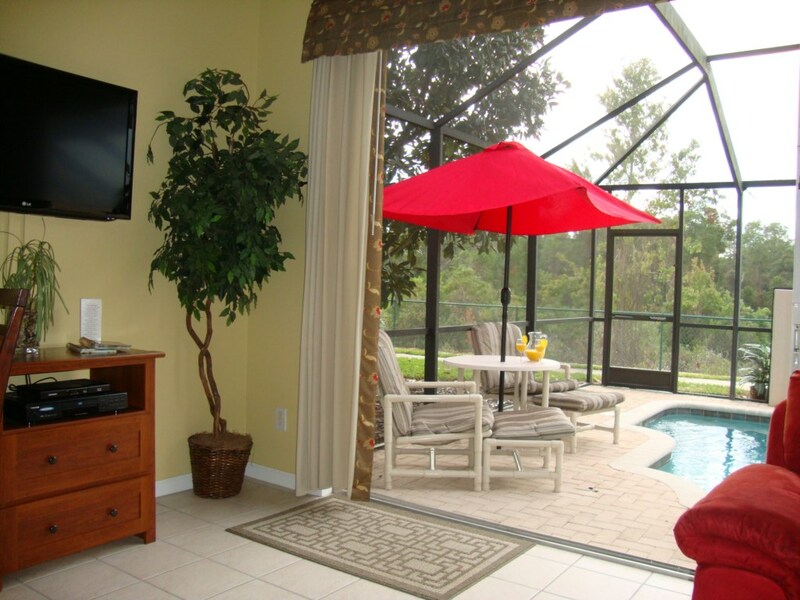 The lanai is fully screened and furnished with a table and umbrella, reclining chairs, ottomans and a comfy lounger. Sun shines on lanai all day so you can enjoy your tanning but we have an umbrella and a magnolia tree for shade. FOR ADDED SAFETY OF SMALL CHILDREN WE PROVIDE A REMOVABLE SAFETY FENCE AND ALL DOORS LEADING TO THE DECK HAVE ADDITIONAL LOCKS. Pool is very well maintained and is crystal clear blue; so inviting. This pool is just the perfect size. (approximately 13x13 feet. Shallow end approx. 3 ft deep , deeper end approx 5 ft deep). There is an in water sitting ledge at one end. Our children actually love the size of this pool better than the very large family pool at home. It is so great to sit and relax by the pool after a busy day at the parks. This bedroom, containing a queen bed, is located downstairs which makes it ideal for those who have a difficult time with stairs. 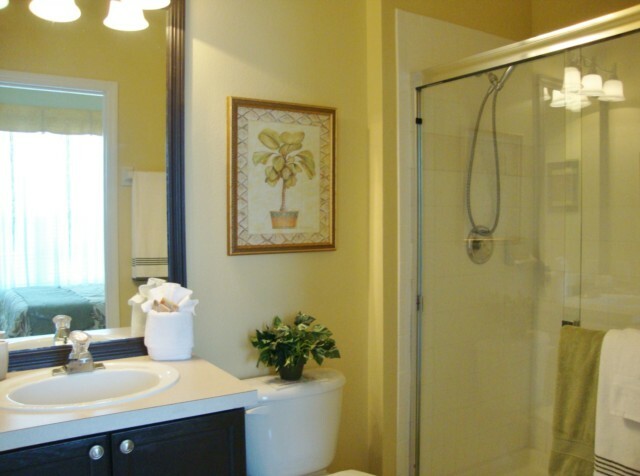 This room has an adjoining bathroom with walk in shower. The room has a ceiling fan,flat screen cable tv and is carpet free. Hairdryer in bathroom. 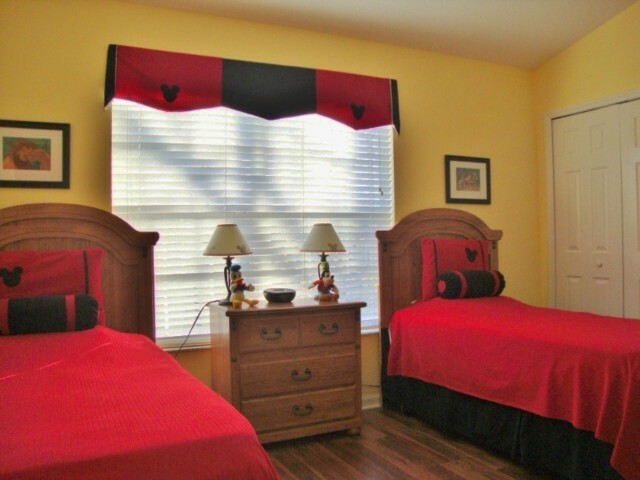 This room is located upstairs overlooking the quiet conservation area. It contains a very comfy king sized bed (one of our past guests have said it was the most comfortable bed they have ever slept in). Like all our bedrooms, this room has a ceiling fan and is carpet free. You will enjoy watching cable tv on the flat screen tv with DVD player. The ensuite has a large garden tub and a power showerhead and hairdryer.. The bedroom is also equipped with an i-pod docking station. 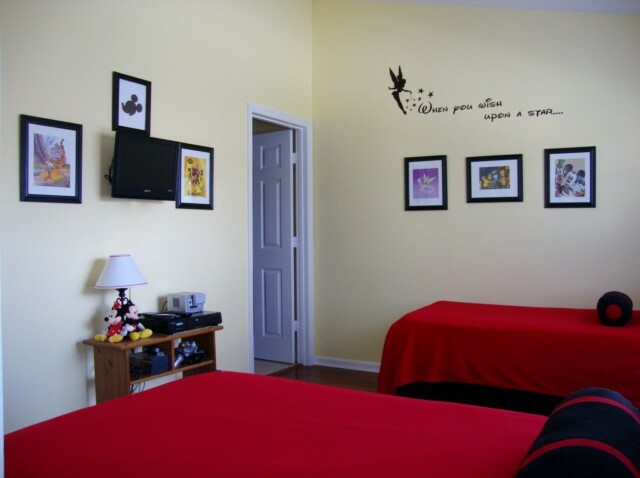 Adults and children alike will enjoy our Disney themed bedroom containing two twin beds. (We have a deluxe fold up bed that will set up between the two twin beds for the 7th guest.) We have provided some games and books for those "quiet times". 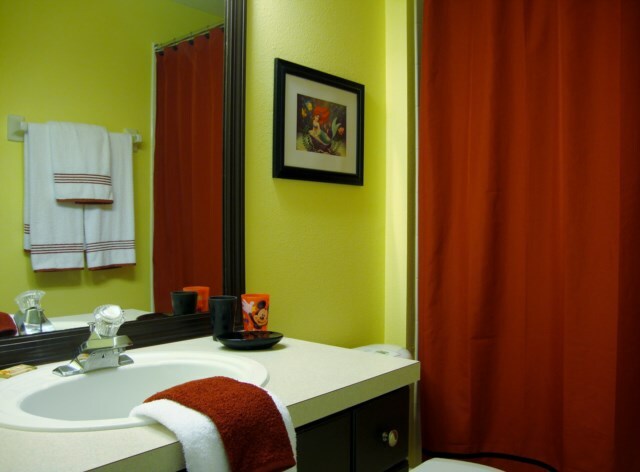 The ensuite bathroom is also Disney themed and has a shower and tub and a hairdryer. This bedroom is also carpet free. Great for those with allergies. We have provided an i-pod docking station, a wall mounted flat screen cable tv with DVD player..
We have a full size washer and dryer and ironing board and iron so you can pack less to bring with you. (We know how expensive airport charges are for extra luggage). PARKING at your front door. Not a long way to lug all those suitcases. Plenty of additional parking is available nearby. We love our home and visit it at least twice a year to make sure everything is kept to the high standards we and our guests expect. "Lovely townhome" April 5/11 - Ron & Donna Barkhouse, Bridgewater, N.S. To Confirm booking, a deposit of $250.00 must be sent along with completed booking form. Final payment is due 8 weeks before arrival. l REFUNDABLE security deposit of $250.00 is required and will be returned within 14 days if no damage is done to the home. Optional Pool heat (recommended April - Nov) is available for $8.00 - 12.00 per night depending on season. Your enquiry will be sent to villa ref 3520 only. This page has been viewed 10660 times since 22 Apr 2012.